Boo! The Halloween Season is officially here, and what better way to celebrate than to don something supremely scary? We’ve got a wide variety of spooky and kooky horror costumes up our sleeve, so dive on into Halloween Adventures and let the fright fest begin! Start things off right with our Dr Phobic Scary Halloween Costume. The costume includes a coat, cravat with medallion, top hat, character mask with attached gray hair, and character hands. It’s guaranteed to frighten the little ones, so you might want to save this one for after they’re in bed. If you’re looking to dazzle with your outfit, try our Evil Jester Adult Halloween Horror Costume. This scary black and white checkered costume includes shirt with skulls, pants, waist sash, headpiece, and a totally freaky skeleton mask. Boo ha ha ha ha. 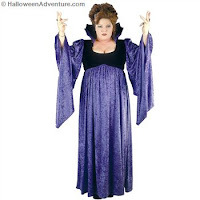 Frightful females will love our Evil Queen Adult Halloween Costume. Deck yourself out in a getup of purple and black with our two-toned dress with draped sleeves and separate stand up collar. This outfit commands respect with its sense of power and glamour. Halloween’s gone wrong with our Evil Scarecrow Horror Costume. This bloodied and wrecked costume includes top, pants, and hat with attached hood. 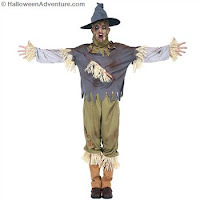 It’s clear this scarecrow has an enemy in someone. Either that, or he’s risen from the dead, back to avenge his captors. Go spooky fabulous this Halloween in our Ghostly Gent Adult Horror Costume. This all white getup includes coat, vest with attached shirtsleeves, pants, dikie with scarf collar, hat, gloves, and a wig. We recommend white face paint and a ghoulish attitude! Check back soon for Part II of our Horror Costume series! Happy Halloween costume hunting!